An effective equine vaccination program always begins with a discussion with your veterinarian. However, with rapid developments in vaccine technology and a seemingly endless array of products on the market, it's often hard for horse owners to know how to launch the discussion. Each category contains further points for owner and veterinarian to consider together. Age of Horse - Is the horse in a high-risk age group for a particular disease? Reproductive Status - Certain disease may affect reproductive function but will not impact geldings. Is your horse in a boarding/training facility? Does he travel/compete in horse-dense environments - racetracks, shows, etc.? Does he have exposure across fence-lines to neighboring farms? Other mammals - wild or domestic? Human visitors from other barns? Temperature and climate fluctuations can affect vector populations and/or persistence of an organism in the environment. Between climate change and the increasing ease and frequency of travel, geographic disease patterns are shifting. Witness the spread of West Nile Virus across the U.S. a few years ago. Immune function - older horses, horses that have been ill or stressed, or horses that have been treated with corticosteroids may have compromised immune systems. All vaccines must meet safety standards in order to be licensed by the USDA. Any animal can react to any vaccine at any point in its life. However, some vaccines carry a higher risk of reaction than others. Also, a horse may react to the adjuvant (binding agent) within a vaccine rather than to the vaccine antigen itself. For example, a horse that reacts to a Rabies shot may not be allergic to the Rabies antigen, but to the adjuvant used by that particular company. He may not react to a Rabies vaccine from a different manufacturer. Human Safety - Whether or not we want to admit it, not all horses are angels about needles. How realistic will it be to give your horse the vaccines specified on the day specified? Does additional planning or training need to be done? Vaccine efficacy - How well will it work? All manufacturers must prove vaccine efficacy to USDA satisfaction for licensure. Temperature - has the vaccine been stored at the proper temperature (usually refrigerated) throughout the supply line? Handling - reconstituting a vaccine (mixing the diluent with the powder) too far in advance may cause it to lose efficacy. Administration - a vaccine that is not administered via the correct route or that is improperly given may not be effective or may have an adverse consequence. Most vaccines require about 2 weeks for full effect after a booster dose is given. With limited exceptions, a horse that has never been vaccinated against a disease will require more than one dose (spaced several weeks apart). Immunity peaks within a certain period following vaccination and decline toward the end of the vaccination cycle. Plan vaccination so that horses will be at or near peak immunity during times of peak exposure. What should I vaccinate against? Download and print the Dig DeeperTM Barn Guide to Vaccinations that contains all of the tables from this article. 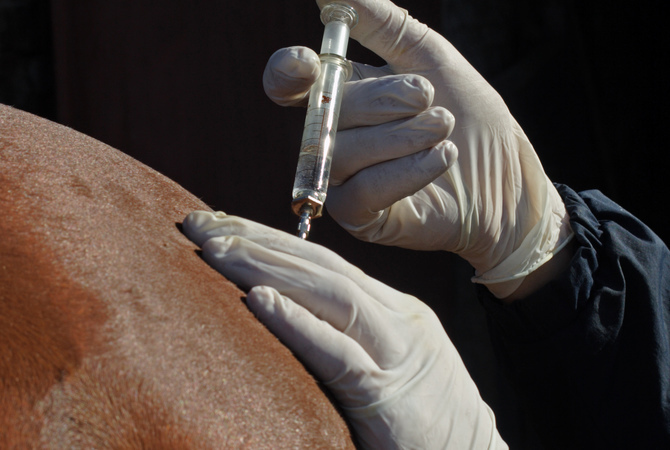 Diseases against which we vaccinate horses fall into two main categories as defined by the American Association of Equine Practitioners (AAEP): core vaccinations and risk-based vaccinations. For horses with a solid vaccination history, these guidelines are fairly straight forward. Vaccination frequency may be dependent on local circumstances. Some practitioners recommend a second West Nile Virus vaccination in areas where the disease has occurred recently. WNV Mosquito 1-2 times per year. Tetanus Soil Yearly - unless injured. Rabies Mammals Yearly - unless exposed. The AAEP has categorized vaccines against the following diseases as "core vaccines." According to the AAEP, core vaccinations "protect against diseases that are endemic to a region, those with potential public health significance, required by law, virulent/highly infectious, and/or those posing a risk of severe disease." "Core vaccines have clearly demonstrated efficacy and safety, and thus exhibit a high enough level of patient benefit and low enough level of risk to justify their use in all equids." In other words, core vaccines are a safe way to protect horses against dangerous diseases that carry a high risk of exposure. Caused by a soil-borne organism, Clostridium tetani, tetanus is a life-threatening disease characterized by severe muscle paralysis. Tetanus is often contracted through a wound, most commonly a deep puncture, but can also occur as a complication of a hoof abscess or uterine infection. All horses are at risk. Both EEE and WEE are caused by mosquito-borne viruses. Both diseases produce severe, life-threatening neurologic disease characterized by staggering, tremors, dementia, seizures, and even death. Exposure occurs wherever mosquitoes are present. All horses are at risk. A viral encephalitis, causing symptoms similar to WEE and EEE. Exposure occurs through the bite of an infected mosquito. Birds are the long-range carrier. Horses cannot transmit WNV to humans or to other animals. Exposure occurs wherever infected mosquitoes are present. All horses are at risk. An invariably fatal neurologic disease. The virus that produces rabies is shed in the saliva of a rabid animal. Rabies is also a human health exposure risk. A rabies-infected horse can transmit the disease to a human. Common carriers of rabies in the United States include: dogs, cats, opossums, skunks, bats, raccoons, and foxes. However, any mammal may become infected with and thus transmit rabies. All horses are at risk. Some horses may be at higher risk of particular diseases by virtue of age, geography, housing, or function. Vaccines against diseases in this category may vary in efficacy or risk of complication. Also, not every horse will be exposed to every disease. Risk-based disease vaccination planning requires the input of a veterinarian familiar with your horse and his use. EHV -1 Infected horses 6-12 month intervals for horses at risk. EHV -4 Infected horses 6-12 month intervals for horses at risk. Influenza Infected horses 6-12 month intervals. Strangles Infected horses, contaminated equipment Yearly. EVA Infected horses, carrier horses, contaminated equipment, trans-placental Yearly 1 -- special conditions apply. Consult your veterinarian. PHF Aquatic insects infected with Neorickettsia risticii 6-12 month intervals, preceding peak challenge in summer/fall. VEE Mosquitoes Yearly, in high risk areas only. Consult veterinarian. EHV can cause three forms of disease: respiratory, abortion in mares, and neurological. The neurologic and abortive forms of the disease are typically caused by EHV-1 while either EHV 1 or 4 can produce respiratory disease. While there is no specific vaccine against the neurologic form of the disease, vaccination against EHV-1 can potentially provide some cross protection. EHV is transmitted from horse to horse through contact from fluids and by airtransmission. Pregnant mares are at risk of abortion. Foals and young horses are at risk for severe respiratory disease. Horses of any age can contract the neuropathic form. Mature horses may have some immunity to respiratory disease. Equine Influenza Virus (EIV, Flu) produces fever, malaise, and respiratory symptoms such as nasal discharge. Flu can result in days missed from training or performance, and can make the horse vulnerable to opportunistic pathogens that can cause pneumonia. Like the human influenza virus, equine influenza is a frequently mutating virus, and vaccine companies frequently need to redesign their products to include the most likely viral mutations for the year. Horses aged 1-5 years are most susceptible. Young horses aged 1-6 years are at highest risk. Caused by Neorickettsia risticii, Equine Monocytic Ehrilichiosis was originally associated with the geographic region surrounding the Potomac River. However, the causative organism has been found in horses from California, Illinois, Indiana, Kentucky, Maryland, Michigan, New York, New Jersey, Ohio, Oregon, Pennsylvania, Texas, and Virginia. Signs of the disease include: fever, diarrhea, laminitis, mild colic, and decreased abdominal sounds. Pregnant mares can abort if infected at 7 months gestation. Horses in other parts of the United States and Canada have been positive to serological testing. Ttrue geographic range of the disease is currently unknown. Like WEE and EEE, VEE is a severe neurologic disease caused by a mosquito-borne virus. Unlike in WEE or EEE, horses infected with the VEE virus are capable of replicating the virus and infecting other mosquitoes, thereby spreading disease. VEE has several viral serotypes that are typically categorized into two types: enzootic, a milder form, usually causing less severe disease; and epizootic, a less common form that causes severe neurologic symptoms. VEE is typically confined to South and Central America. However, in 2011, cases have been isolated from horses in Mexico. EVA is caused by the Equine Arteritis virus. EVA is primarily of reproductive concern as it can cause abortion in pregnant mares, death in young foals, and a permanent carrier state in stallions. Although many exposed horses will develop no disease signs, when clinical disease does develop, it manifests through: fever, swellings (legs, sheath, scrotum, udder, and around eyes), loss of appetite, depression, conjunctivitis, nasal discharge, rash, abortion in mares, pneumonia/death in foals, short-term sub-fertility in stallions. EAV infection is transmitted through: respiratory secretions, venereal contact, indirect contamination (tack, equipment, hands, clothing), and across the placenta from mare to foal. Infected (sexually mature) colts and stallions may become permanent carriers of the virus. Because this carrier state depends upon the presence of male hormones, geldings, mares, and immature colts cannot become carriers. Botulism is a highly fatal, rapidly progressive neurologic disease caused by toxins produced by the Clostridium botulinum bacteria. The toxin can be ingested in contaminated feed, through an overgrowth of bacteria in the gut (known as Shaker Foal syndrome) or through wound or umbilical cord contamination. Disease may be prevented in foals in high-risk areas through vaccination of pregnant mares. Several points need to be considered when vaccinating a pregnant mare. The foal acquires its early immunity from the mare - 90% through the colostrum (first milk). If the mare is not protected against a disease, the foal will not be either. EHV-1 Months 5,7,9 of gestation to prevent abortion. WEE Booster 1 month prior to delivery. EEE Booster 1 month prior to delivery. WNV Booster 1 month prior to delivery. Tetanus Booster 1 month prior to delivery. Rabies Booster 1 month prior to delivery. Influenza Booster 1 month prior to delivery. EVA At least 3 weeks prior to breeding. Consult veterinarian. Botulism Subject to regional variation. Consult veterinarian. WEE 2-dose series 4-6 weeks apart. Booster 4 weeks prior to foaling. EEE 2-dose series 4-6 weeks apart. Booster 4 weeks prior to foaling. WNV Inactivated vaccine: 2-dose initial series 4-6 weeks apart (may have limited response in pregnant mares) booster 4-6 weeks prior to foaling. WNV Canarypox vector vaccine: 2-dose initial series 4-6 weeks apart; booster 4-6 weeks prior to foaling. WNV Chimera virus vaccine: single dose initial vaccine; booster 4-6 weeks prior to foaling. Tetanus 2-dose series 4-6 weeks apart. Booster 4 weeks prior to foaling. Influenza Inactivated-virus vaccines: 3-dose series; 2nd dose 4-6 weeks after 1st; 3rd dose 4-6 weeks prior to foaling. Influenza Canarypox-vectored vaccine: 2-dose series 4-6 weeks apart; 2nd dose no later than 4 weeks prior to foaling. The newborn foal's immune system initially has very limited function. In the weeks after birth, almost all of the foal's ability to fight disease comes from the antibodies it gained from the mare (see above). As the mare's antibodies wane, the foal's immune system "comes on-line." However, one set of shots at weaning is not generally sufficient to properly protect a foal against disease. With a few exceptions, vaccination requires repeated exposure to generate immunity. With foals we talk about a primary "vaccination series." It is important not to skimp on these vaccinations. Though no one likes the idea of giving multiple shots to a young horse, there is evidence to suggest that the quality of early immunization can impact a horse's immunity to disease throughout life. It is much safer to bite the bullet and comply with the entire foal vaccination series rather than to risk immune failure later. EEE 3-dose series beginning at 4-6 months of age; 2nd dose 4-6 weeks later; 3rd dose at 10-12 months of age. WEE 3-dose series beginning at 4-6 months of age; 2nd dose 4-6 weeks later; 3rd dose at 10-12 months of age. WNV Inactivated vaccine: 3-dose series beginning at 4-6 months of age; 2nd dose 4-6 weeks later; 3rd dose at 10-12 months of age. WNV Recombinant canarypox vector vaccine: 3-dose series beginning at 5-6 months of age; 2nd dose 4 weeks later; 3rd dose at 10-12 months of age. WNV Chimera virus vaccine: single dose at 5 months of age or older. Booster at 10-12 months of age or before next mosquito season. Tetanus 3-dose series beginning at 4-6 months of age; 2nd dose 4-6 weeks later; 3rd dose at 10-12 months of age. Rabies 2 dose initial series beginning at 6 months of age with booster 4-6 weeks later. Annual booster. Strangles For foals at high-risk: killed vaccine -- 3-dose series beginning at 4-6 months of age , 4-6 weeks between boosters. Strangles Modified live (intranasal) -- 6-9 months of age with a booster 2-3 weeks later. Influenza Modified live (intranasal) -- single dose at 6 months of age or older. Influenza Inactivated vaccine: 3-dose series beginning at 6 months of age; 2nd dose 4-6 weeks later; 3rd dose at 10-12 months of age. EHV-1, 4 3-dose series beginning at 4-6 months of age; 2nd dose 4-6 weeks later; 3rd dose at 10-12 months of age. PHF In high-risk areas: 2-dose series at3- 4 week intervals beginning at 5-6 months of age. Booster at 12 months of age. Botulism In high-risk areas: 3-dose series at 4 week intervals beginning at 2 months of age. VEE Controversial; only warranted in high risk areas. Consult veterinarian. EEE 3-dose series beginning at 3-4 months of age, second dose 3-4 weeks later, 3rd dose at 10-12 months of age. WEE 3-dose series beginning at 3-4 months of age, second dose 3-4 weeks later, 3rd dose at 10-12 months of age. WNV Inactivated vaccine: 3-dose series beginning at 3-4 months of age; 2nd dose 30 days later; 3rd dose 60 days after that. WNV Canarypox vectored vaccine: vaccinate at 5-6 months of age; second dose3- 4 weeks later. WNV Chimera virus vaccine: no data available for foals younger than 5 months of age. May be more appropriate for boostering older foals. Tetanus 3-dose series beginning at 1-4 months of age with 4-weeks between doses. Rabies Initial series according to label directions (begin at 3-4 months of age.) Annual booster. Botulism In high-risk areas: 3-dose series at 4 week intervals beginning at 1-2 months of age. Consult veterinarian. NOTE: Foals born to unvaccinated mares or mares with unknown vaccine history are at particularly high-risk for disease. Veterinary input into this vaccine program is critical! As we discussed with foals, vaccination success relies upon repeat exposure. With a few exceptions specific to some of the newer vaccines, vaccination works by exposing the immune system to a small amount of a protein specific to the disease causing organism (the antigen.) The first exposure to the antigen primes the immune system. However, the disease-fighting antibodies do not develop significantly until the body encounters the antigen a second or third time. Adult horses that have never been vaccinated or where vaccination history is unknown (ie. auction purchase, rescue, etc.) will require an initial vaccination series similar to that for a foal. WEE Mosquito 2-dose initial series 4-6 weeks apart. Booster prior to next mosquito season and annually thereafter. EEE Mosquito 2-dose initial series 4-6 weeks apart. Booster prior to next mosquito season and annually thereafter. WNV Mosquito Inactivated vaccine: 2- dose initial series 4-6 weeks apart. Booster 1-2 times per year after. WNV Mosquito Canarypox vector vaccine: 2- dose initial series 4-6 weeks apart. Booster 1-2 times per year after. WNV Mosquito Chimera virus vaccine: single dose initial vaccination. Booster 1-2 times per year after. Tetanus Soil 2-dose initial series 4-6 weeks apart. Booster annually thereafter unless injured. Rabies Mammals Single primary dose. Revaccinate annually. EHV -1 Infected horses Primary 3-dose series spaced 4-6 weeks apart. EHV -4 Infected horses Primary 3-dose series spaced 4-6 weeks apart. Influenza Infected horses Modified-live intranasal: 1 primary dose. Influenza Infected horses Canarypox vector: 2 doses 4-6 weeks apart; revaccinate every 6 months. Influenza Infected horses Inactivated vaccine: 3- doses; 3-4 weeks between 1st and second, 3-6 months between 2nd and 3rd. Strangles Infected horses, contaminated equipment Consult veterinarian. EVA Infected horses, carrier horses, contaminated equipment, trans-placental Special conditions apply. Consult veterinarian. PHF Aquatic insects infected with Neorickettsia risticii 2 dose primary series 4-6 weeks apart. Complete 2nd dose 3-4 weeks prior to peak season. VEE Mosquitoes In high risk areas only. Consult veterinarian. Below is a table containing vaccines and manufacturers for currently USDA licensed equine vaccines. Vaccine manufacturers release new products periodically and may pull products from the market as their catalogue changes. Consult your veterinarian regarding the best choices for YOUR horse. Always work with your veterinarian to develop a vaccination program for your horse!